Megan Mills Circular Bicolour Prime Rib (Brioche) Hat — if I were to enter this project in the State Fair competition, I would be so much better off using Megan’s pattern! 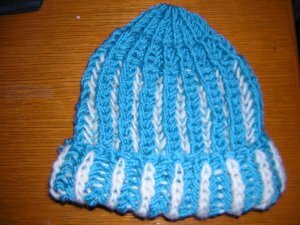 This entry was posted in Knitting, Recipes. Bookmark the permalink. Actually, the twisted German cast on will work, I think, for the hat — at least the way I’ve done it, it is “two sided” to match the dominant colors on the inside/outside of the hat itself. On the other hand, the ribbed German cast on is what I used for a brioche stitch scarf I’m working on, since I’m assuming the bind-off-in-pattern will match that better — I don’t know of a bind off that would match the twisted cast on. I’ve got a draft of a post on the scarf — my reinterpretation of the Baldwin article referenced above. If you want early access, let me know. Okay, I’ve put new comments on Google docs for the time being — see http://docs.google.com/View?id=ddzhjjgr_6fggkvxgm for more pictures of prime rib hats and a scarf along with the instructions for the scarf.